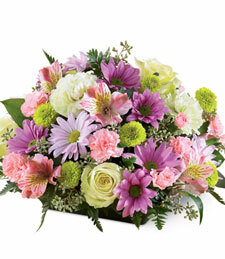 Exquisite pastels shimmer with beauty and grace from this stunning array of pink, lavender and green flowers! 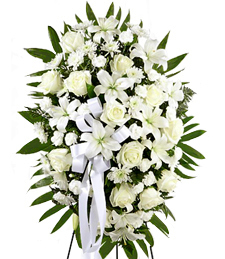 Sure to make any room sparkle, these blissfully beautiful blooms make an utterly breathtaking and heartfelt gesture of your deepest sympathy, support and fond remembrance. 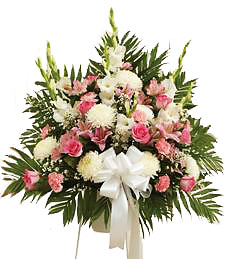 Glistening white and precious pink blooms shimmer and shine with the most charm and charisma ones eyes can capture of a Strawberries and Cream Standing Basket. 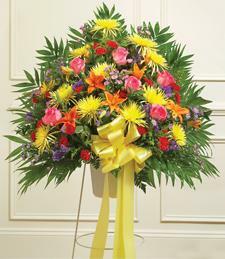 Give them wings and set them free in this difficult time of grief for the pain of loss is only a temporary passing. 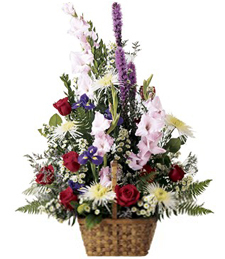 Grace the presence of that Spiritual Journey Sympathy Basket with a perfectly designed touch of gentle shimmering blossoms in shades of tranquil white and mystic purple in a standing sympathy basket as a simple display of compassion in difficult times. Guide them down the pathyway of healing and their gratitude will never be forgotten. Be that guided friend at their side in a time of grief with A Prayers from Above Standing Spray for a precious soul is never forgotten. Take a trip down memory lane of the most precious times ever with a glimpse of all white blossoms that shimmer and shine with that glitz and glamour. 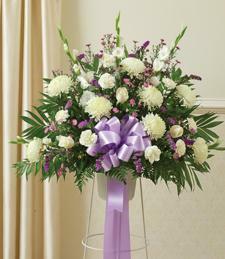 Open your heart and soul to a spiritual awakening of a Heavenly Bliss Sympathy Basket of delicate shimmering white and precious lavender blossoms meant for enchanted precious memories with that grieving special someone. Nuture their heart and soul with deep compassion and natural beauty for the entrance to healing is a passing pf time. 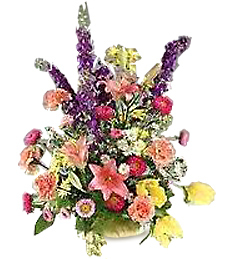 Hues of Sympathy Standing ..
Sooth their grieving soul with a Hues of Sympathy Standing Basket in bold shades of red, orange, yellow, pink, and purple to sway them from their troubles. There is nothing more profound to forget their pain than a plethora of ravishing natural beauty! 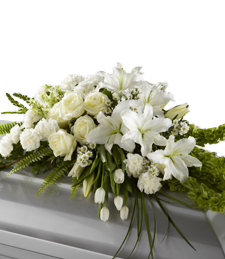 Your utter compassion is to be remembered for eternity. Salute to A Memorable Life for a precious soul is never forgotten. Take a trip down memory lane of the most precious times ever with a glimpse of all white blossoms that shimmer and shine with that glitz and glamour. Dazzle them with refined sophistication for a comforting token of affection glimmers in the room like stars of a night sky. 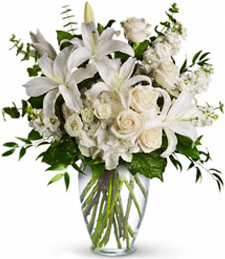 All white blooms share that sense of eternal peace and tranquility. 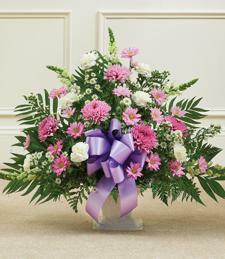 Be that shining moment in their life as they heal from the loss of a loved one. 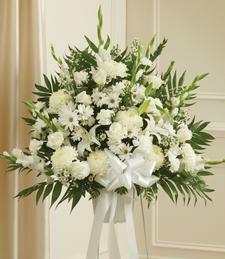 Pay tribute to a dear friend or loved one now at rest with this stunning array of fresh flowers. 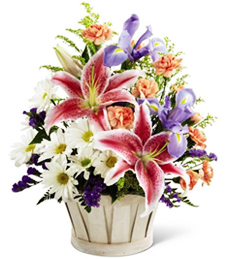 Shimmering with nature's beauty and grace, these blooms are a heartwarming and truly touching gesture of your warmest sympathy, support and fond remembrance. 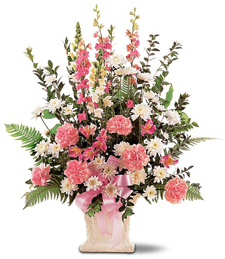 An exquisite spray of beautiful blooms, this piece radiates grace and elegance. 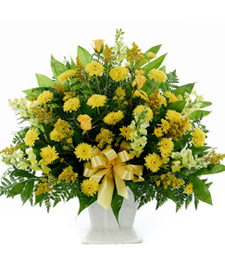 Fresh, sweet smelling flowers will brighten these difficult times, while your gesture of warm sympathy, support and fond remembrance will be deeply appreciated by those left behind. 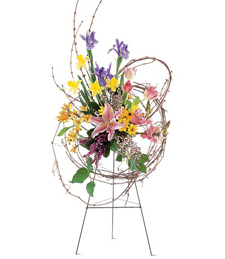 An ode to nature's beauty and grace, this exquisite easel brims with stunning, fresh flowers. 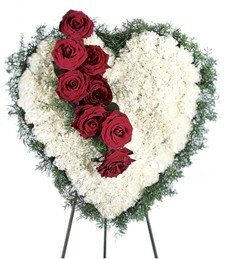 This lovely piece is a heartwarming and thoughtful gesture of your warmest sympathy, support and fond remembrance. 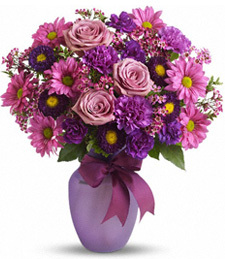 These brilliant blossoms exude vibrance and beauty. 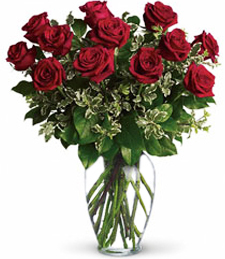 Sweet smelling and accented with verdurous greens, this medley of flowers is a classic gift for someone special. 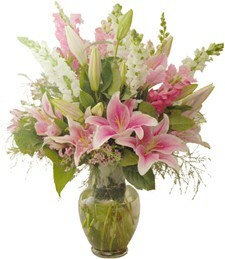 Pink and white is a match made in heaven always right for any occasion! Dive into that midst of Morning Sunrise for a cherished life is worth living. Deep hues of gold and yellow blossoms mirror a time of happiness and peace in one's life for every moment that passed counts for a lifetime of rememberance. 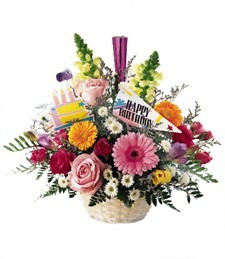 Fun, festive and truly felicitous, this marvellous medley of vibrant flowers radiates bright beauty and cheerful charm! 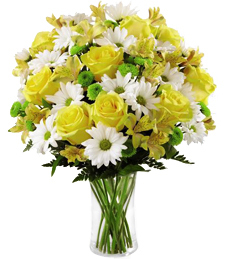 Sure to brighten even the most difficult of times, these beautiful blooms make a sincerely sweet and heartwarming token of your deepest sympathy, support and fond remembrance. 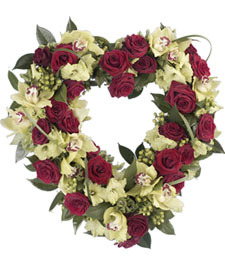 A charming momento of remembrance, this elegant arrangement of pink, purple, blue, red and yellow roses makes for a heart-felt way to honor the memory of a friend or loved one who has passed away. A Light from Heaven Casket..
Ignite that healing moment in a time of depair for that special someone for a true friend is always cherished. 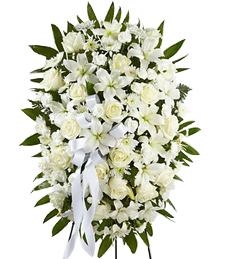 Celebrate in rememeberance of a life well-lived with a shimmering plethora of an all white blossoms casket spray that airs of that special charisma to highlight the moment. A Light from Heaven is shining above!